Appearance: A tall, & very physically strong individual, Maul is a very frightening & intimidating looking man. He is dressed & colored in such a way all for the simple purpose of influencing fear upon his enemies. As the apprentice of his master, Lord Vader, & as a high ranking member of the Star Fleet organization, Maul possesses a menacing black robe in which he wears most often. Underneath, he wears a black fighters-tunic. Similar to a martial artist & with black gloves as well. What makes this man even more terrifying in appearance is his very physical & facial appearance itself. Maul's body has been nearly completely painted in a series of red & black stripes. Possibly painted by his fellow warriors & tribes from where he comes from. The "horns" on his head are likely for the same reason. But they add an intimidating feature nonetheless. Furthermore, his eye color is a sinister yellow. He always carries his weapon of choice- A double bladed "Light Saber." A weapon created by the organization & is superb in combat. Maul carries a Sabor that can be activated with two individual blades, but the saber can be separated in two individual blades. Personality: Maul is as cold, sinister & as evil as they come! He is pure hatred & fear incarnate according to his master. He has been chosen by his master for his hateful & powerful warrior spirit & desires only to spread fear to all his enemies! Believing that "Fear attracts the fearful… the strong… the weak… the innocent… the corrupt. Fear. Fear is my ally." He is a true cold blooded killer & takes much pleasure in seeing his enemies suffer and/or in pain. His hate & his evil make him the perfect apprentice under the wing of Lord Vader, the Supreme leader of the Star Fleet organization & is the top assassin & highest ranking member. Outranked only by his master. But he possesses the spirit of a powerful warrior & thus gives him the desire of seeking & defeating powerful enemies. He always considers himself to be the most powerful & aims to be so. Biography: The history of this evil man is shrouded in complete & utter mystery. Much is unknown of his past & very little is ever rarely mentioned. 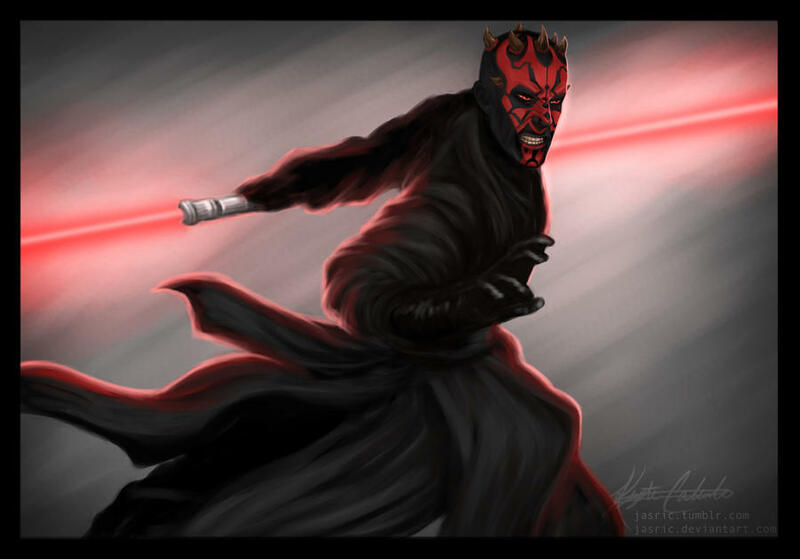 It is believed that Maul was born & raised under the wing of an ancient order & tribe of powerful, fearless warriors. Bound to increase their physical & spiritual strength through combat of powerful foes. Throughout his life, he was trained in the tribes art of combat. Known today as "The Force." Young Maul was quick to learn the art of such combat & would grow up to be a powerful warrior amongst. But he was also feared amongst his fellow tribe members, feared for his ever growing hate & feared for his fierceness & ruthlessness. As he entered his early adult years, it is believed that he was faced with a series of trials that would eventually lead him to the ranks of the most powerful warrior. This included completing dangerous tasks & missions to hone & sharpen his skills & even the elimination of the tribes enemies. Then, later, the tribes were faced with war against another rival clan. Maul was called into action & fought alongside his fellow warriors. It was Maul himself who had killed the rival-clan leader with his own blade. It is said he brought death to his enemies swiftly & with a flash of crimson from their blood. This, in turn, earned him the title "The Phantom Menace." & the most powerful warrior in the tribe. His skin was soon painted to appeal to his new entitlement, & thus was colored in such a horrifying series of black & red patterns across his entire body. The "horns", although fake, were added for finishing touches. But when Maul attempted to appoint himself as the head of the tribe, his fellow tribe members began to fear the worst. The elders would not grant Maul leadership, for fear of his growing bloodlust & desire for battle. Hearing this only fueled Maul's rage....To the point where he killed his own warriors for their "betrayal." With the blood of his fellow men in his hands, Maul soon went on his own for the rest of his days. As merely a legend & a part of folklore of the one they called "The Phantom Menace"- A warrior who sought out only to seek out & defeat powerful foes to strengthen himself. Those who were unworthy, he would kill. Those who were, would live to fight him another day. Indeed, his warrior spirit & uncontrollable violence & ruthlessness was untamed & unmatched. His skills as a warrior & as an assassin were feared by all.